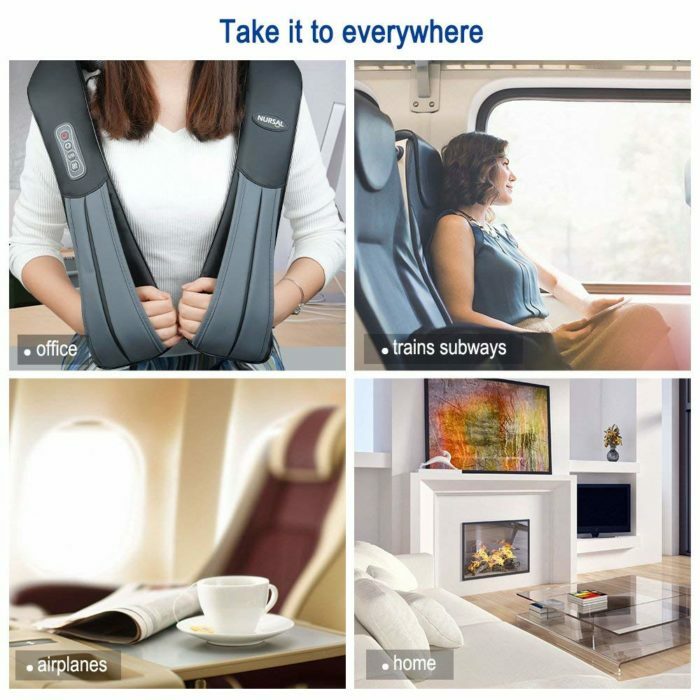 CORDLESS & RECHARGEABLE – The internal rechargeable lithium-ion battery offers you about 2 hours of wireless massage experience after 3-4hours charging. A great choice to get rid of the wire tangle and do not worry the short cable. 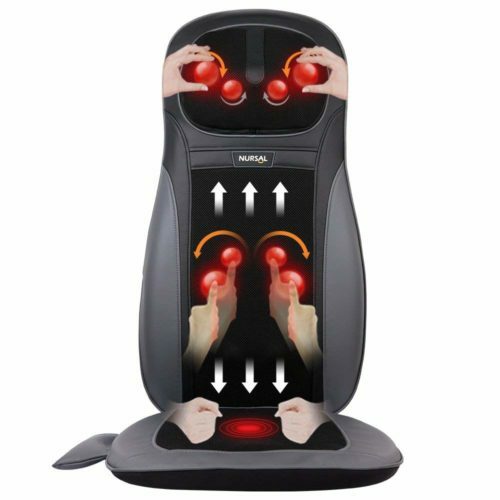 SPEED & DIRECTION CONTROL – Fast and slow speed to choose for suitable pressure; automatically mode changes direction and speed in every few minutes provides mimic human massage. You can also change the direction and speed by one-button control. Question: Is it compatible with 220 volt? Question: How exactly do you recharge the battery? Answer: Plugs into the provided charger. Question: how long is the cord?, does it bog down when applying pressur or is the motor strong? Answer: The cord is a little over 5′ long. It has a strong motor that doesn’t bog down when applying pressure. Question: Does it work while charging? Question: How does this compare to the wired one? Is it the exact same, except wireless? Answer: This is a chargeable one. You can either use it plugged in or detach it. I bought it a year ago and have been using it until now. This product is really good. It releases all my muscles and makes me feel good while I massage. I used to go to the massage shop once a week before buying this, but I have never gone there using this product. That product is satisfactory. Great for work or roadtrips! I love this! Good pressure and I love that it has heat! One side on the first massager I received quit working after two minutes of use. After I sent an email with photos & a video, the company was quick to reply and send a replacement that I have had no trouble with at all. I have enjoyed using it. It has helped get kinks out of my neck and back and is easy to operate. I gave four stars since the first one didn’t work, but I would definitely recommend this product. Finally a product that works for me! I never have ever found anything to hit up this muscle of mine just right for my shoulder. I’ve been contorted up to hit it right with the chairs just to get some relief. Love this item! It is the best thing I have found! Very very very very happy! Not enough stars for me up too to give it the rating it deserves. Thank you for designing something that helps relieve my pain! 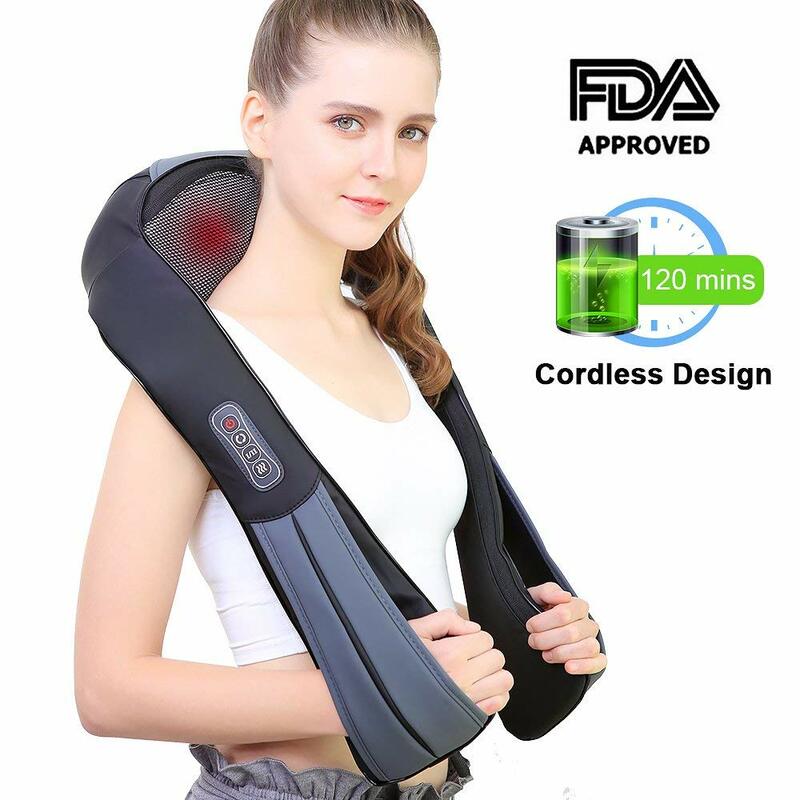 Nice Product for shoulder massage…. So far this is working really well!. It gives a great massage. Kind of amazing. That is an amazing massager, I got it as a gift from a friend of mine and actually decided to reach out and leave a review because I’m so surpriced how good is that and comparing to other shiatsu massagers I had before this one is the best, I had two different before that I purchased in local stores and they were so painful and only caused discomfort but this one is a true relief after hard day of work. 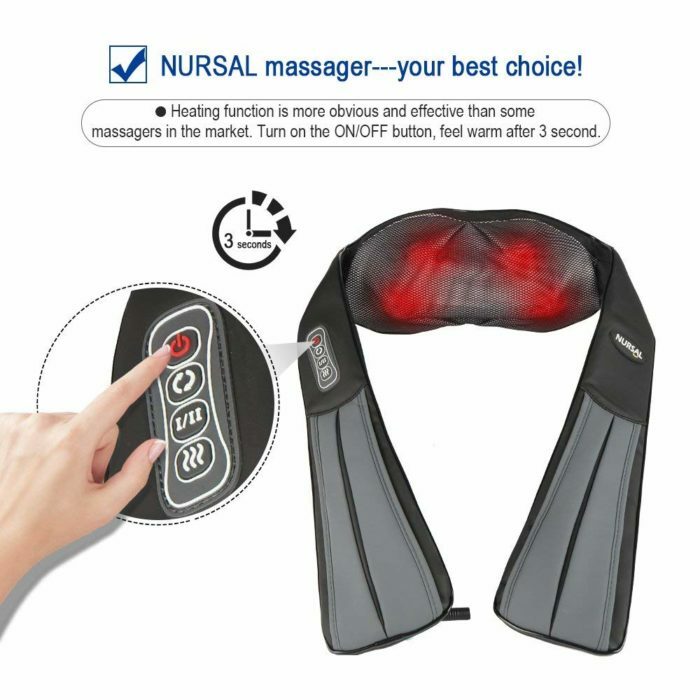 there are different massage modes and I like it is cordless. This massager was a great gift to my wife who has power back pain. 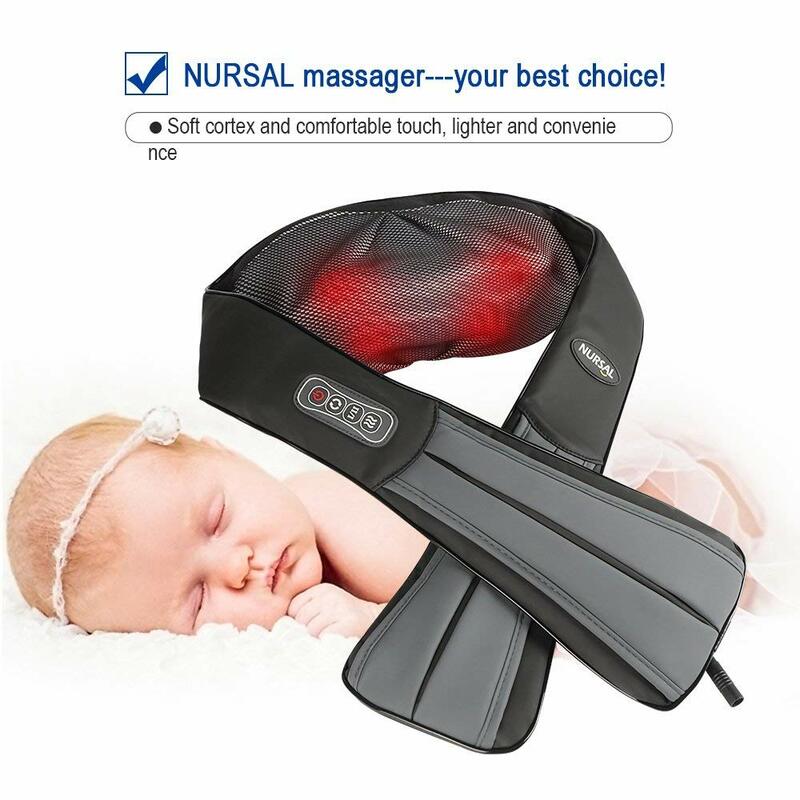 It’s great that you can use the straps to tighten or loosen the sensitivity of the massager. It glows red when heating and blue when hating is turned off. There are two balls on each end that going in circles and can go in reverse if preferred. Two modes with fast and slow. Pretty simple setup but made a world of difference. Worked on my wife’s back and my leg after running and shoveling through this past nor’easter. Works great on the neck and lower back. You can apply pressure to work on other parts of the body as well. The material feels luxury as a matte surface and smooth interior. Very happy with it. heating doesn’t work for me. and I can’t even return it as I sent it to my home country as a gift to my parents! Update to the review: after posting an issue about the heating..the customer support person got in touch with me and offered me to send improved product with enhanced hearing. Just got this and I felt instant relief in my shoulders after one use. I chose this one for the good reviews that fact that it’s cordless and that the modes are adjustable. I would definitely buy again or give as a gift to someone else. Very happy – feels great! I got this for my husband for a Valentine gift but I am using it more than he is! I got it for him when he travels and I sure will miss it (and him) when they go! 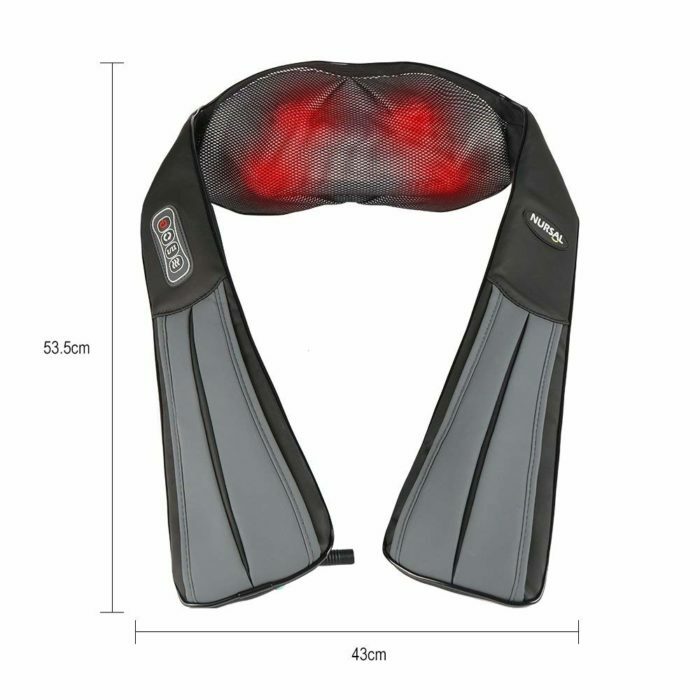 Very convenient to use and excellent for the neck and shoulders in particular but can be used in any sore areas. It definitely is strong and that is what we wanted. This is great! The instructions were easy to follow and worked as expected. I used it for my neck, shoulders and back without a problem. You can use it plugged in an outlet or you can let it charge and then it could be cordless. It also comes with the attachment to plug in your vehicle. I like that it is cordless. It allows me to take it with me without staying put. I also love the heat feature, works wonderful. I will recommend to others! The more I use it the better I like it. Charge lasts a long time. Robust neck massage. Not much heat who’s understandable as it is cordless. I would buy again. Works great with two knobs on each side. I like that they include a car power adapter in case we need it on a road trip. Buttons are simple to use and the back lights up to show if it’s on and if on heat mode. 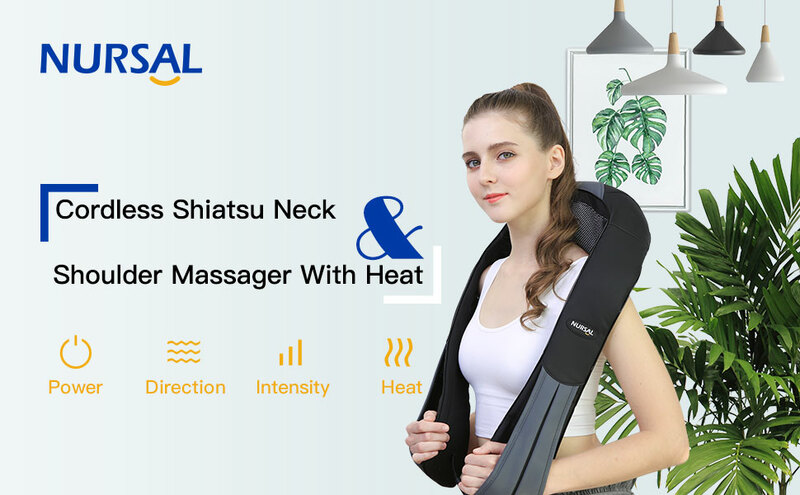 The heat mode provides a nice warm sensation to the neck. Very happy with this purchase. Works as expected and really helps work out kinks in the neck and shoulders. 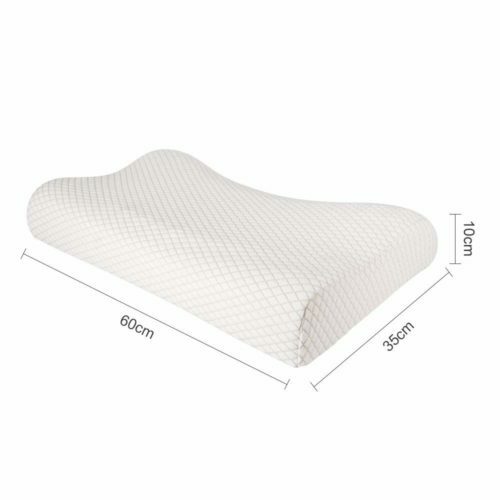 This product is of sufficient quality for the price, like all the features. Could be a little lighter and more detailed instructions should be provided. Overall worth the price and performs well. 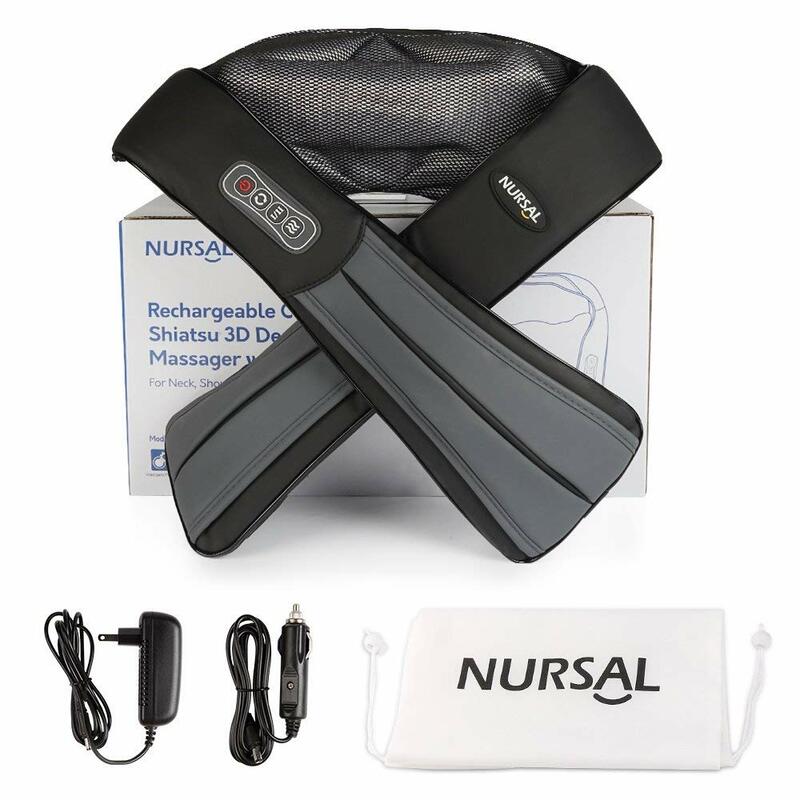 The massager is well built and easy to use. It hits all the right spots on my wife’s neck and shoulders. Just what she was looking for! Really love that it’s rechargeable! Fast shipping. Great product! Thank you! This product exceeded expectations- my wife, and my children ALL enjoy it as much as I do. 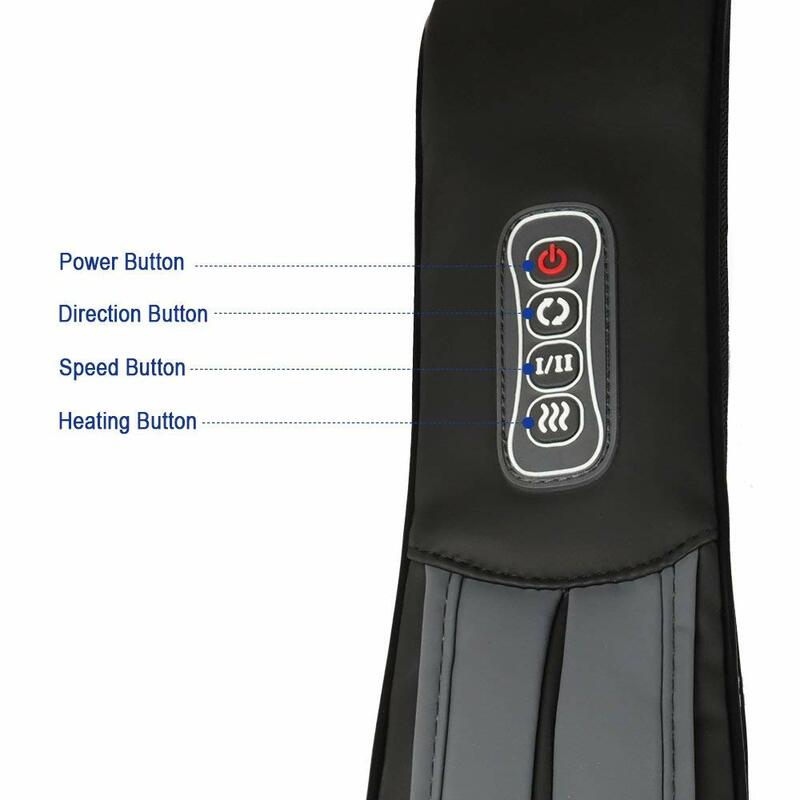 If you have any stiffness or soreness in the mornings/evenings I highly recommend this massager. I think it’s the exact same thing as the “Gronk” sold at Brookstone but at a fraction of the cost. 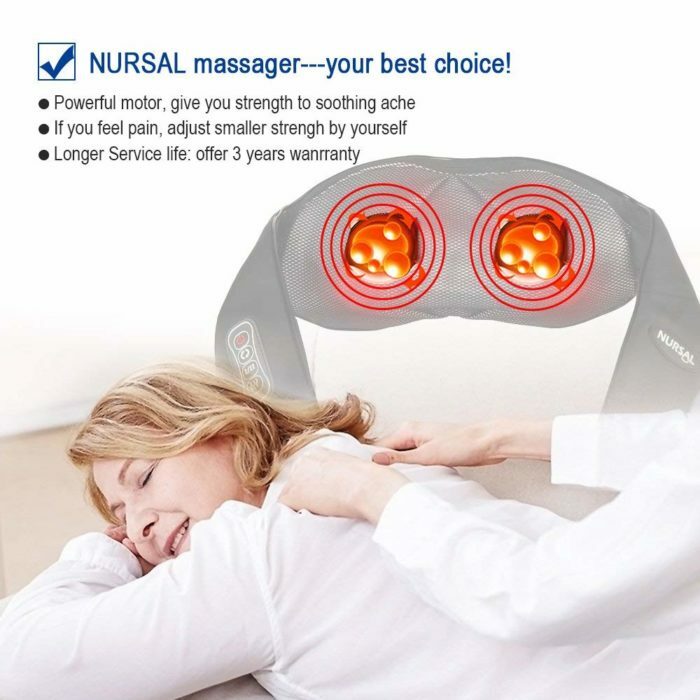 I am absolutely happy with Nursal shoulder massager. 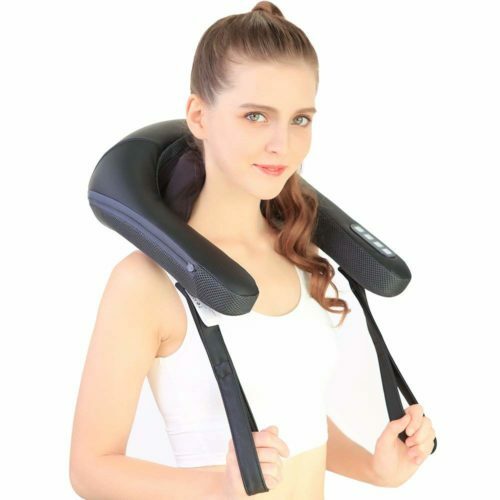 It hits all of the knots in my neck, shoulders and upper back that no other massager could get to. Not too heavy and the arm slots are great. 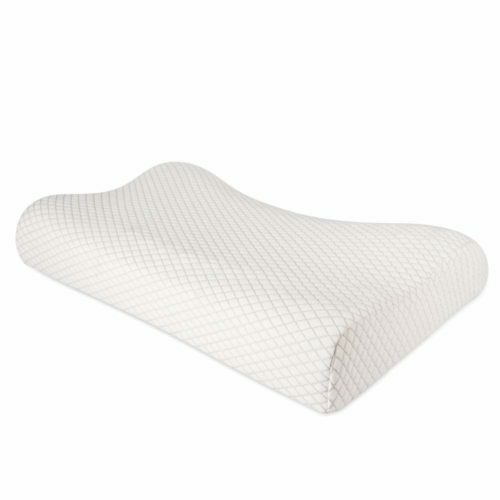 Really helps on my back and shoulders & neck. Not too heavy and the arm slots are great. OMG! Love it! Bought it for a long 10 hour flight and it relaxed me so much, I was able to fall asleep. I will use this product regularly and it is one of the best purchases I have ever made. It is better than any massage I have ever received. I love the heat!!! It caught attention on the plane, but mostly just envy! LOL! My father has neck and upper back pain for a long time. I bout this massager for him, He very happy with this massager and saying that this one exactly meets his needs. 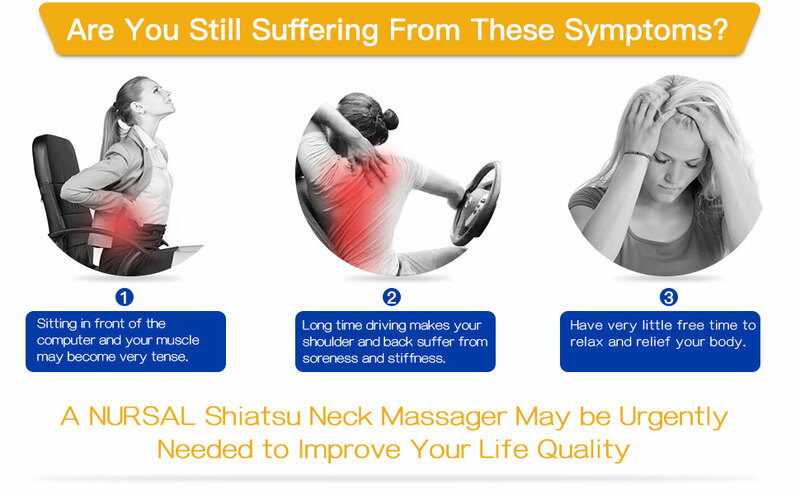 It’s powerful and can be adjusted to massage upper back, lower neck, upper neck, or even other parts of the body. It has reduced his neck pain quite a bit from time to time. Problem was resolved. Thank you. 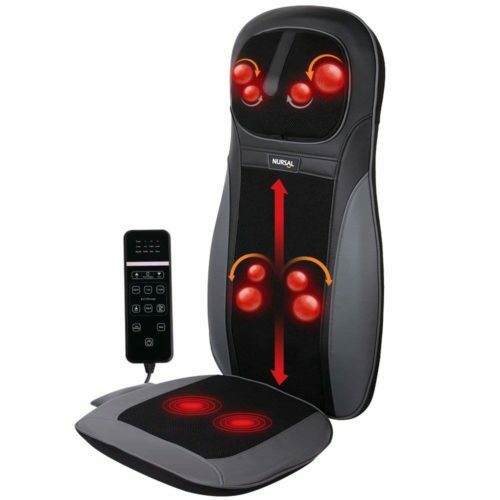 Love this massager… you are able to move it around to all of the great spots. And since it’s battery operated you can just walk around while getting a good massage. AMAZING… I feel sooooo relaxed! I bought this as a Christmas gift for my partner and they absolutely love it. Since they do a lot of manual labor for their work, they love using it at the end of the day. Recently, they lent it to their father and now he won’t return it back to us! I love how it’s cordless and the heat setting is perfect for me. It’s not too hot. I’ll be purchasing another for my father in law too! When it arrived, my girlfriend proposed to me. The best mobile massager I have EVER used! My husband bought it for himself, but now we both use it and love it! Bought this for my boyfriend for Christmas since he’s always working on his computer and always complaining about shoulder pains. This product has been used everyday since the day we opened the box. Truly does its job and has found many knots in my back. We feel so much better after using this product. Must have! My husband loved it! It is so so good, incredible!